Robometricschool. - This is one of the flip-flop principle to build LED knight rider or also called with LED running light based on transistor. This circuit very suitable when you implement it in your car, motorcycle, bike to make other people view your own vehicle. In here we will give you the LED knight rider using transistor circuit schematic, component parts, and also the description of this circuit and the last we will allow you to read more this project from original source. This is Circuit Schematic LED Knight Rider using Transistor for Motorcycle Application for you in this time. Accordingly Electronichub site describe that from the circuit diagram, it is clear that the project is based on simple Astable or a Free Running Multivibrator. When switch on the circuit, one transistor will be ON (in Saturation) and the other will be OFF (Cutoff). Assuming Q1 is ON and Q2 is OFF, the Capacitor C2 will charge through series LEDs. Since the LEDs are connected in the path of the current, they will light up. During this time, the transistor Q2 is OFF because of the discharging capacitor C1 (as the negative plate is connected to the base of Q2). After the time constant C1R1, the capacitor C1 is completely discharged and starts charging through R1. The charging direction is reverse. As the capacitor charges, it builds up sufficient voltage (0.7V) to turn ON the transistor Q2. At this time, the capacitor C2 starts discharging through Q2. As the plate of the capacitor C2, which is connected to the base of the transistor Q1, becomes negative, the transistor Q1 is turned OFF and this set of LEDs are turned OFF. Now, the capacitor C1 starts to charge from the corresponding series LEDs (through base of Q2). As this set of LEDs are connected in the current path, they will be turned ON. Now the capacitor C2 discharges and after complete discharge, it will start charging through R2. As the charge builds up in the capacitor C2, when the voltage reaches 0.7V, it will turn ON the transistor Q1. From this point the process repeats as earlier. 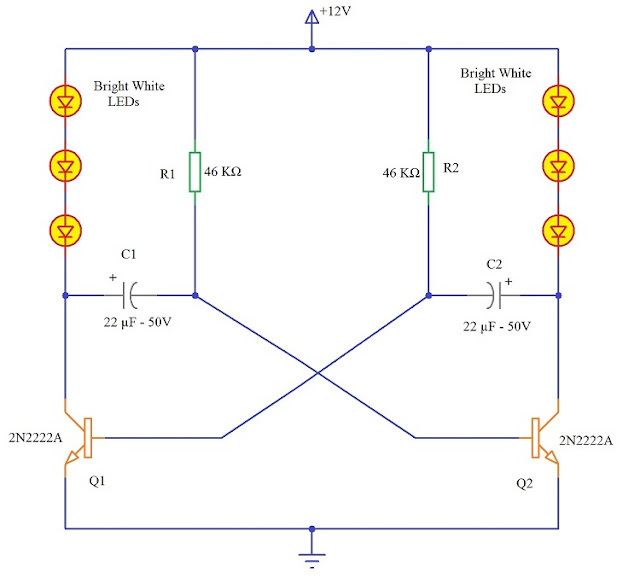 For more information about this circuit schematic of LED knight rider using transistor for motorcycle application you can read more HERE.